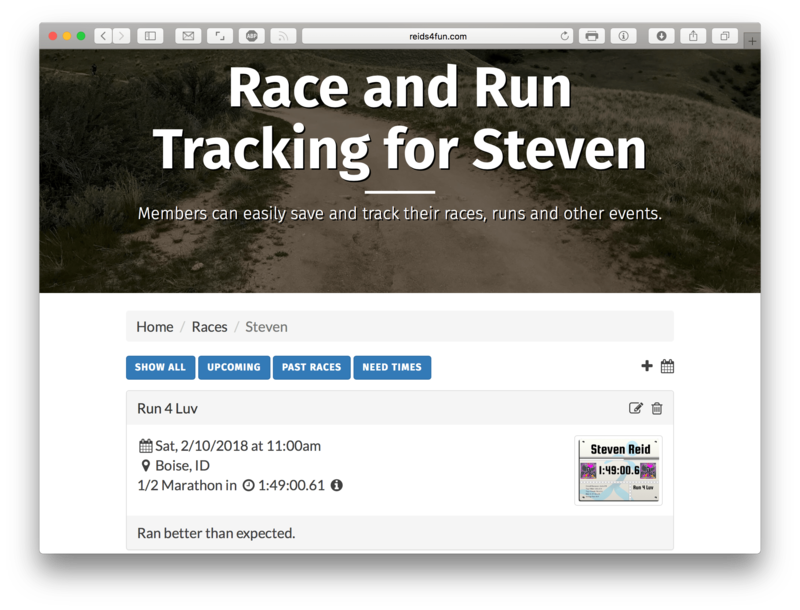 To kick off my new running blog, I’m introducing a race and run tracker tool. I’ve been thinking about starting a running blog for some time now. Okay, I’m usually running at the same time. Call me crazy, but I enjoy it. So much so, I have completed quite a few races since I started running again. To kick things off, I offer up my Race and Run Tracking tool. Although I’ll share more in future posts, I started to run again about thee years ago. But, things didn’t click until I ran a 10K at the YMCA Famous Idaho Potato Marathon & Fun Run. After that race, I set a goal to run a 1/2 Marathon. Though, before that, with some nudging from friends, I ran a few virtual races. Although that was fun, it started me doing something I hadn’t done before—tracking my races. There are a few reasons to track races. Besides reminding me what I ran, it allowed me to track personal bests and note when I struggled. Plus it wasn’t the most friendly, requiring me to enter a race if it didn’t already exist. Most of mine didn’t. In the end, the site is being discontinued, forcing me to make a decision. A race tracker is what I need. I went looking for alternatives. I found a couple that seemed to fit the bill, but weren’t as easy as I’d hoped. I didn’t want to add races, all I wanted to do was track my races in a simple and easy way. So, I wrote my own. The Race and Run Tracking is free for anyone. You'll need to register an account on my site first. Once done, head over the races sections to start adding your races. The form is pretty basic, but I’ve been adding features during my use over the last few months. Introducing my Race and Run Tracker. First off, I added a nice calendar picker. It makes it easy to select the date of the race. And, you can edit or paste in a date if you want. I like options. You can put the race time as well. Although required, but you can leave the default if you don’t care. But, I recommend you add it for the next feature. My wife was asking about when all my races were. I wondered if I could export my races in a calendar format? To my surprise, the answer was yes. After some programming and testing, I had a workable calendar. I even figured out how to import it into Google and sync with with my iPhone. Note that I generate all day events with start times noted. 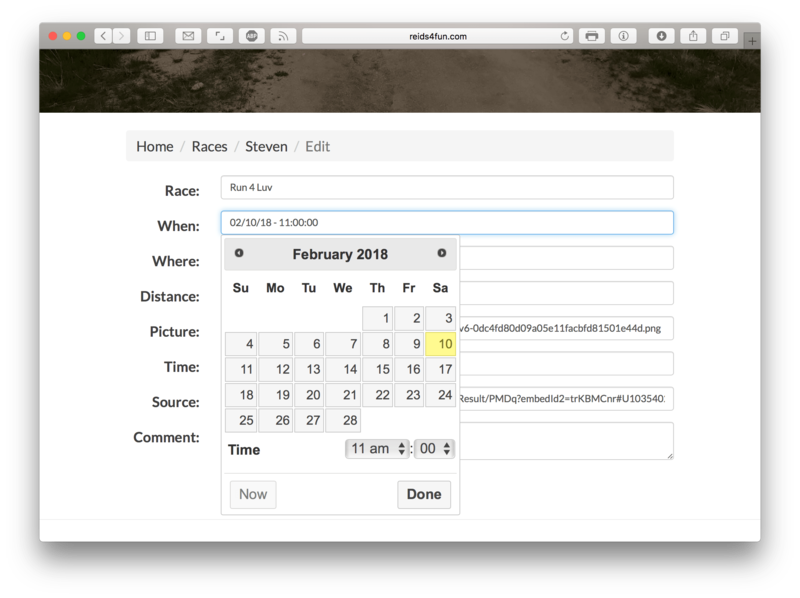 The date and time picker on the Race Tracking form. The distance is free form on purpose—I wanted you to be able to put in any distance you might decide to run. Want to add a triathlon, spartan, or even a 1K fun run? Go for it. But, to make things easier, I added an autofill with some popular distances. Because it’s about you, there is a race icon (trophy) at the top once you log in. It will take you to your races where you can add in new ones, grab that calendar link, or filter your races. My favorite is the “need times” filter. It makes it easy to add in my times after a race. I have a few more ideas I’d like to put in place, but I’m happy with how it stands. If I get a few more users, I’ll watch to see what they like or don’t like about it. Until then, it is functional and meets my needs.